The 2nd year of The Handover has started on fine form this month. Hosted over at Notes from Mosquito Hill, Mack has asked all of us bloggers to share a story that shows the passion that we have for what we do, or how the job affects us. There are tales of joy, sorrow and hope to be found amongst some of the fine submissions to be found when you click this link. Go and have a read, and find out why this job called EMS is so special for so many of us! 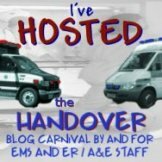 « Biggest EVER EMS Blogger Meet up?